I carry my rainbow with me.......Only if we could all carry our rainbows with us like Koshy does! 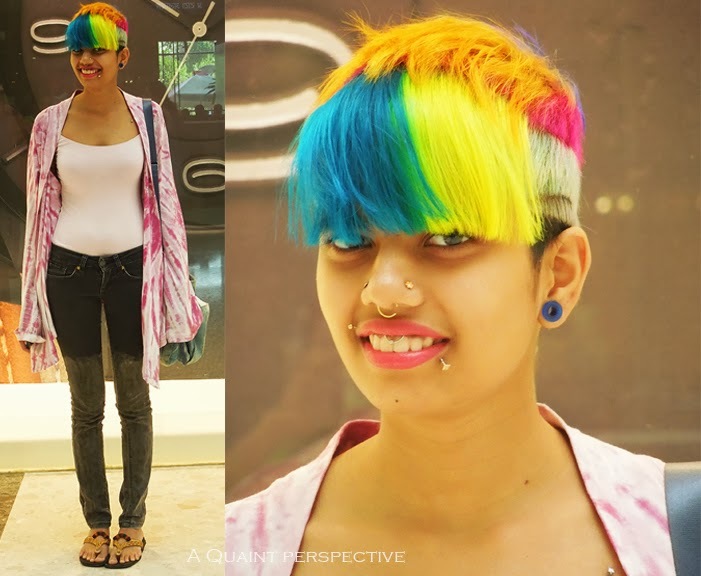 Koshy is definitely a Head turner, one cant not turn one's head to notice this daring girl sporting a hairstyle in all the rainbow hues. Being a hairstylist does open her up to the myriad possibilities of hairstyles but I was amazed at the perfection with which the fringed and layered cut-style-color was executed on her. Another thing you notice instantly about Koshy is her love for piercings, I could see 8-10 visible piercings on her and I'm sure she has more. Normally heavy piercing and punctured earlobe gives you a very harsh Gothic/Punk look, but on the contrary Koshy manages to have that girly charm and feminine grace to her despite her studs and rings. Her love for play of colors, both dyes and bleach reflect in her choice of clothes as well. She wears a flattering white camisole over a pair of washed black skinnies bleached out thighs downwards. I love the asymmetric long sleeves wrap top in white with real tie-dye in pink and the vintage washed leather bag in jade green that she carries. Next time if I could muster up enough courage for a daring, one-of-a-kind hair, I am seeking an appointment with you.